Dr .Yang loves her job, she feels that if there is one thing that she made the right choice on it is that she chose dentistry as her career. When she was a child she didn't know how to properly brush her teeth. Her dad also gave her candy before going bed as a reward for her good behavior. She ended up having multiple tooth decay and even missing teeth when she was very young. After she became a dentist she experienced all the possible dental treatment available such as fillings, root canal therapy, implants, crowns and bridges. The most important lesson she learned from this is proper home care. She has been decay free for over 10 years now. With her personal experience she has devoted herself to helping others restore their oral health so that they do not suffer the same dental issues as herself. A person of integrity, Dr. Yang is well liked by all her patients for her caring personality and outstanding professional skills. Her gentle and skillful way of providing treatment puts patients instantly at ease. Dr. Yang always stays abreast of the latest technologies for cosmetic and implant dentistry by attending continuing education seminars around the country. She is a member of the American Dental Association, Connecticut State Dental Association and the American Academy of Cosmetic Dentistry. Dr. Yang has been practicing dentistry in Connecticut since her graduation in 2000 from Tufts Dental School. 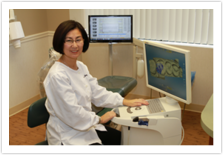 Dr. Yang was born in China and received her degree in Dental Medicine in 1986 from China Medical University. She received her Masters degree in oral pathology at Dalian Medical University in 1992. She has been practicing dentistry for over 20 years. Dr. Yang is also involved in many volunteer programs in our community. She currently serves as President of the Meriden-Wallingford-Cheshire Dental Society. Her and her staff are proud to participate in several local and national dental charities including Give Back a Smile, a program restoring dental health to women who are victims of domestic violence and Give Kids a Smile, which provides free dentistry to children in need. Also, Mission of Mercy which is organized by the Connecticut State Dental Association, providing dental care to the under privileged. Dr. Yang has a wonderful husband, two amazing children Jonathan and Erin, and a spectacular dog named Jason. In her spare time she enjoys spending time with family and friends, swimming, hiking, and is said to be a great chef.